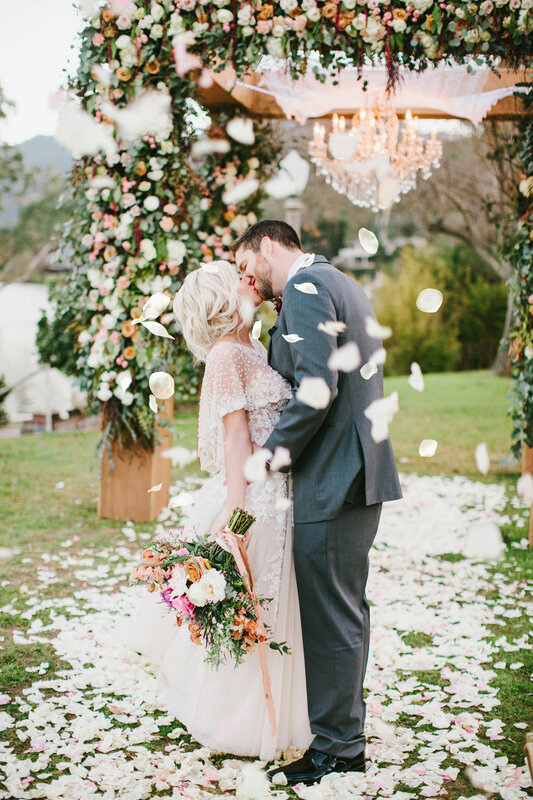 Tami and Roy were married at The Lodge at Malibou Lake, under a chuppah covered in flowers. 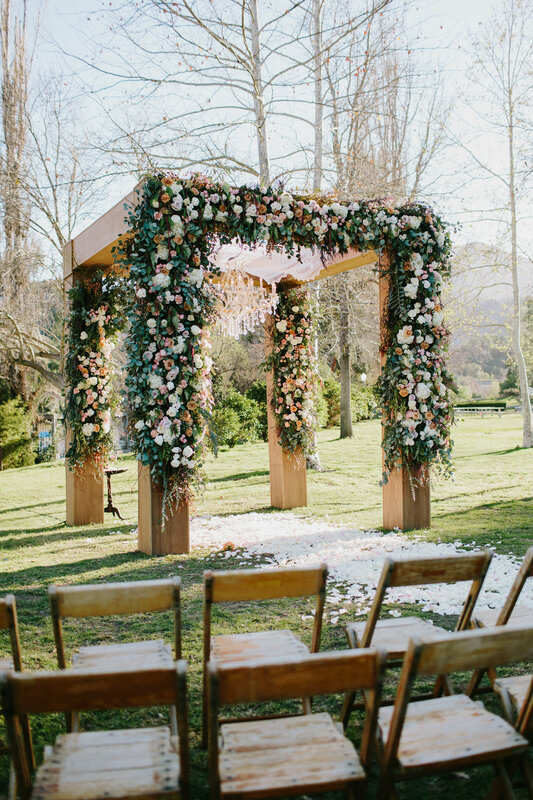 The chuppah, decorated by Rockrose floral, was unforgettable. 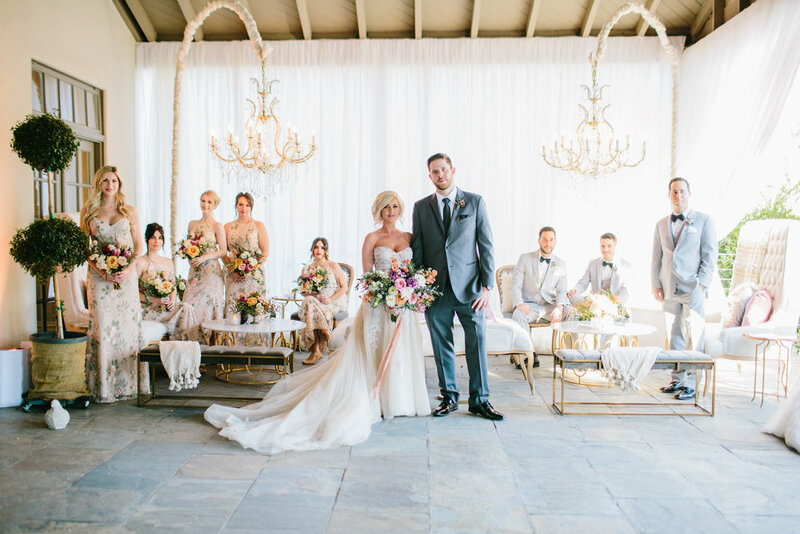 Pink and white roses surrounded by greenery coated the wooden frame, and a chandelier hung from the center. 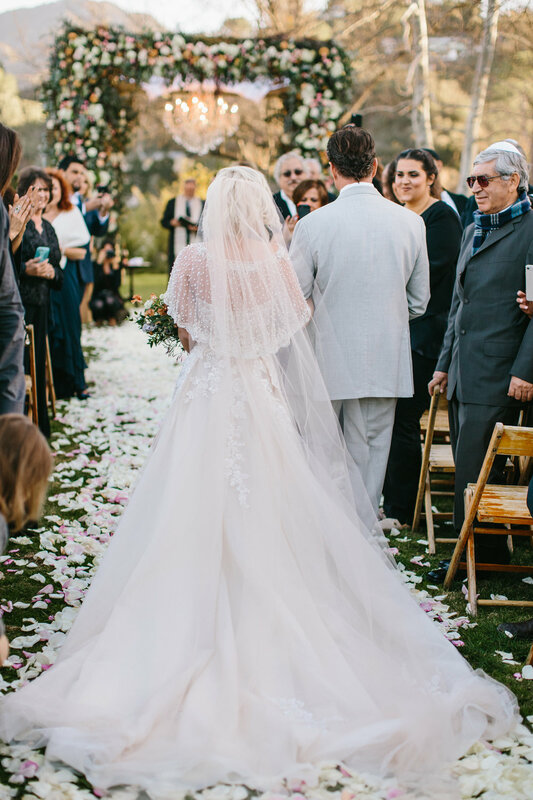 The chuppah was a flawless backdrop for the ceremony, which included traditions from both families. Tami wore a voluminous dress with intricate appliques all over the bodice, and a pair of sparkly Badgley Mischka heels. For the ceremony she wore a loose up do and a sheer capelet dripping with crystals over her shoulders. Bridesmaids wore light pink floral dresses and carried bouquets of yellow, pink, orange, and purple flowers. 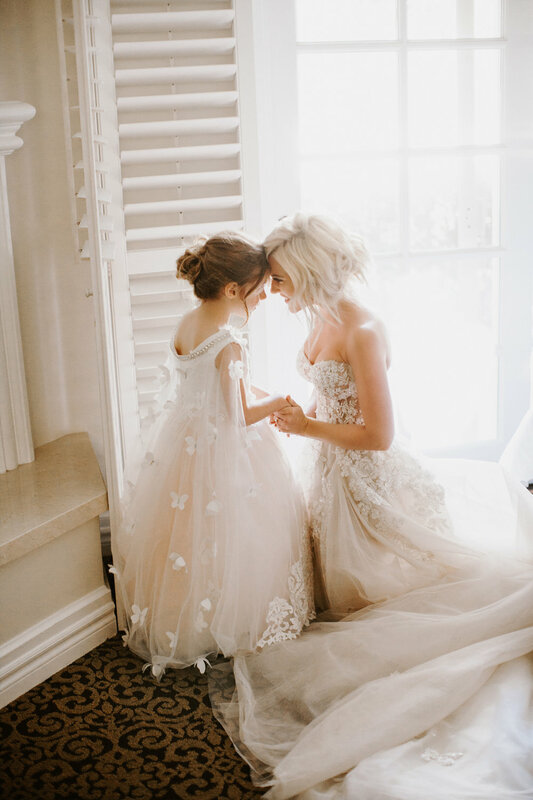 The bride’s daughter Hayden was the flower girl, she wore a white tulle dress and a cape dotted with silk butterflies. One of the sweetest moments of the ceremony was when Roy got down on one knee and began talking to Hayden about how much she means to him as his new daughter. Everyone began tearing up. Tami and Roy sipped the ceremonial wine and said, “I do.” As they had their first kiss as husband and wife a flower petal cannon went off, showering the couple with pink petals. They receded down the aisle to Billy Joel’s “For the Longest Time” played by Elite Disc Jockeys. Family photos were taken by the chuppah as guests headed across the street to cocktail hour. The outdoor lounge for cocktail hour was set up with couches, tables, and a chandelier by Bella Vista Designs. Purple geodes, throw pillows, and blankets brought color to the space. Guests were given french fries and other appetizers while listening to instrumentals from Ybarra Music. It was hard to keep people from peeking through the doors into the reception space, everyone was curious what it would look like. The reception hall included huge centerpieces from Rockrose Floral, and an assortment of mismatched vintage utensils. Gold chargers and purple goblets were a part of each table setting, tying in the colors of the centerpieces. 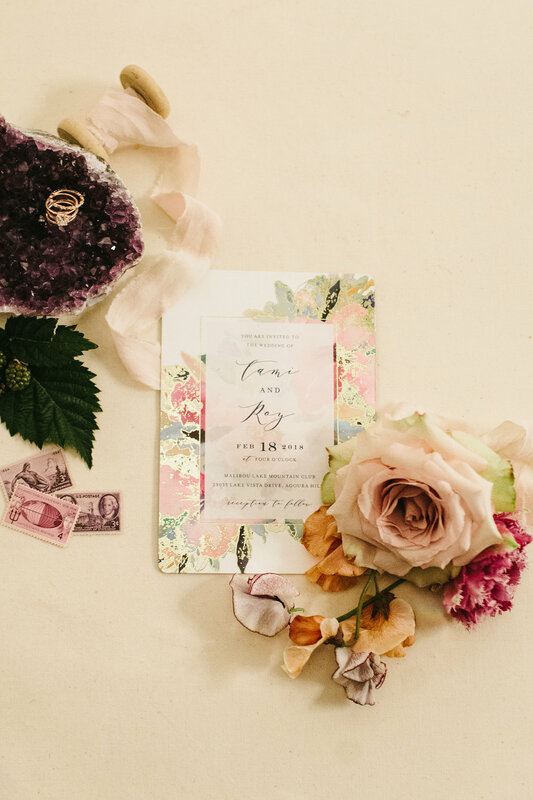 The light pinks and purples were seen throughout the room, including in the florals draping the fireplace and the sweetheart’s table. Guests enthusiastically entered the room as soon as the doors opened. Hummus and pita bread was served along with plated salads as the first course. Then guests were invited up to the buffet, where they could choose from some delicious food by Chef Cordelia. An especially unique feature from Tami and Roy’s wedding was the live painter, who came in with a blank pink canvas and finished the night with a stunning painting of the couple’s first dance. The painting included the flower girl, and both sets of parents, as well as beautifully capturing the feel of the reception space. The guests also loved getting their photos taken in the photobooth from Open Air Photobooth. Guests took multiple pictures and included one in a guest book for the newlyweds. During the reception children could go to the kid’s room, where nannies played games and watched movies with them in personalized teepees. It was a helpful way to let the parents enjoy the reception and keep the wedding kid-friendly. Many of the kids would dash back and forth between the two spaces, wanting to dance but also wanting to build forts with the fuzzy purple blankets. Tami and Roy shared their first dance together to “I Love Your Way.” After, Roy had a special dance with Hayden, spinning her around the dance floor. 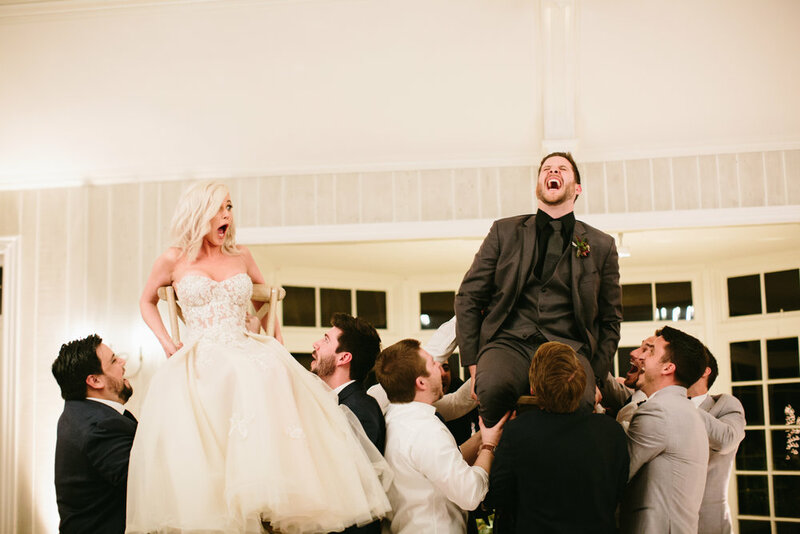 The couple also were lifted up on chairs to dance the Horah. We were worried Tami would fall off the chair because it had no arms on it- but she survived! Towards the end of the night Tami and Roy continued to dance, taking moments for themselves amidst all the excitement of the day. As they were dancing they smiled at each other sweetly. They looked so in love.